E-cookbooks continue to gain popularity. They give you instant access to great recipes and are much more portable than most printed cookbooks. Today I’m sharing an e-book with a very specific gluten-free focus that has recently come to my attention. It comes to us from Alyssa of the blog The Queen of Quinoa. Are you a fan of quinoa? It’s a super food, but many of us do not know what about it until we go gluten free. When we learn about naturally gluten-free foods that are “new” to us, especially whole foods, quinoa often comes into our lives. Although not every single recipe on Alyssa’s blog contains quinoa, most do! She’s really good at both creating recipes that use quinoa and adapting other recipes to use quinoa. Sometimes you’ll find quinoa in more than one form in the same recipe. 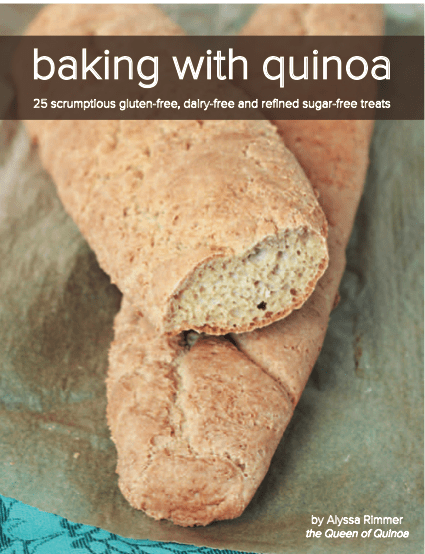 Her new e-book is Baking with Quinoa: 25 Scrumptious Gluten-Free, Dairy-Free, and Refined Sugar-Free Treats. You will find one of her recipes from this e-book, her Double Chocolate Chip Quinoa Cookies, featured over at my other site, All Gluten-Free Desserts … All the Time. 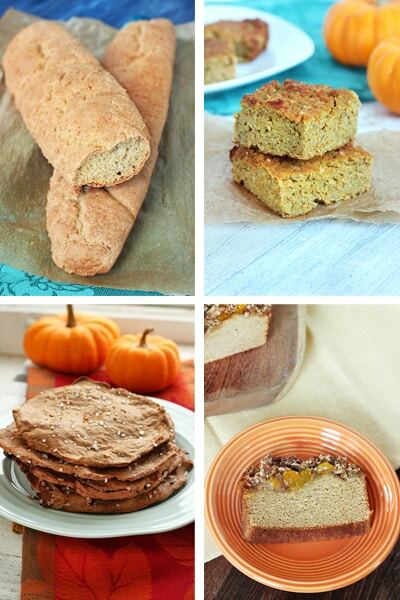 Baking with Quinoa features 25 gluten-free, dairy-free, and refined sugar-free treats. After introducing herself and telling her own personal story (I greatly appreciate personal stories!) in her e-book, Alyssa focuses on all things quinoa with a discussion on the different types of quinoa, toasting quinoa flour, and recipes in the categories of Cookies, Breads & Muffins, Cakes & Tarts, and Other Sweet Treats. 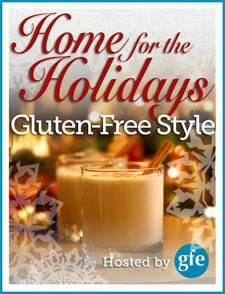 Because this is our Home for the Holidays event, I asked Alyssa about living gluten free during the holidays. I think it’s really helpful to find out how others navigate living gluten free during what can be a challenging time of year. What foods/dishes mean “home and holidays” to you? How do you prepare those foods differently now from when you ate gluten or how have you still filled the “need”/craving for certain holiday dishes over time? Alyssa is running a great special on her e-book right now, plus if you subscribe to her blog you will receive a 20% off discount. But if you’re feeling lucky, here’s the good part, she is giving THREE gfe readers a copy of Baking with Quinoa. To enter this giveaway, simply leave a comment sharing your favorite quinoa recipe or a recipe you’ve wanted to try that features quinoa. The giveaway ends Thursday, December 20, at midnight EST. I confess that I’ve never tried quinoa though I’ve looked at it at the stores. If I’m not lucky enough to win this cookbook I will get it because it’s also sugar-free which I’m sensitive to also. I think the bread recipe looked good but I’m sure there are more goodies to be found. I cook it like rice and sometimes add tomato sauce and spices so it is almost like a Spanish rice. It’s also good for breakfast prepared like grits with butter and cheddar cheese. I have never tried it as a bread but I imagine it would have a nutty flavor! I love quinoa muffins made with cooked quinoa. I usually add cooked carrots and make a cream cheese frosting. YUM! i like quinoa in tabouli instead of cracked wheat, i like it tossed in salads, i like is instead of couscous…. i just like it. I’m a huge quinoa fan – I love how quick and easy it is to cook, which makes it great to use in dishes like curry when I don’t have time to cook rice. I also love quinoa flakes for breakfast as a hot cereal, and also use them in baking a lot – one of my favorite recipes are quinoa banana chocolate chip cookies (http://jeanetteshealthyliving.com/2012/07/quinoa-banana-chocolate-chip-cookies.html) from Jeanette’s Healthy Living. They’re healthy enough to have with breakfast/as a snack but also make a great dessert! Just started using Quinoa.. I like it cooked then toss with sautéed yellow squash and zucchini, lots of Tony Chachere seasoning and drizzled with olive oil.. Bought some quinoa flour the other day, but only have recipe for pancakes on package.. Would love to win a cookbook!!! I don’t have a recipe since we are new to Quinoa, but have bought some and am ready to cook. Hubs has been diagnosed in the past 2 weeks with esophageal cancer and we are making big food changes in our life now. http://www.recipegirl.com/2012/04/02/spinach-salad-with-chicken-avocado-and-goat-cheese/ I plan on skipping the corn though and adding…yep…Quinoa! Thanks for the opportunity to learn more!! I love my homemade ANZAC biscuits (used to be rolled oats, golden syrup, either Self-Raising or plain flour, etc) using rolled Quinoa instead of oats and GF flour. They are traditionally cooked every April. Can’t share the exact recipe though as Freedom Foods have taken it on board in their kitchen and will most likely produce them for the GF market next April. I am waiting patiently for them to send me the first sample pack, but then I can always make them myself. Would love to try other recipes using Quinoa and the photos of some of the recipes in Alyssa’s book look yum. Newish to using Quinoa, so I’d love this giveaway, but I love making pilafs with quinoa, and adding it to,casseroles and soups. Love quinoa with edamame, cilantro, corn, red pepper and lime juice…yum! I am also fairly new to quinoa and to eating wheat free. Two things I am missing and would love to make with quinoa if possible are brownies and granola! I have never tried Quinoa – so I am open to trying anything! I love quinoa! I eat it almost every night cooked in water like rice, with a pinch of himalayan salt then I add tofu and kale or spinach. I would really like to try the double chocolate chip cookie recipe. It’s gonna sound gross, but I love to eat plain quinoa with fresh pressed garlic, olive oil, and a can of wild planet’s marinara sardines all mixed together. YUM!!!! Quinoa with coconut oil, mixed spices, and peas. Simple. Delicious. I haven’t tried quinoa in years but I have been meaning to get some since I recently went wheat free. I didn’t know there was a flour and would love to try to use some to make bread! I don’t have a favorite recipe yet. I have been making up my own thus far. I am having great results but need help. Right now I am collecting recipes. After the first of the year I am going gluten-free. So is my family but they don’t know it. I just started using quinoa recently. It’s so versatile. I’ve volunteered to help a family in the church convert to gluten free to help their recently diagnosed autistic son. I love quinoa and live without dairy, gluten, soy and eggs so quinoa has become a powerhouse food for me! The bread on the front looks awesome. Can’t wait to try these recipes! Cheers to new ideas 🙂 merry Christmas everyone! Quinoa pasta, flour, pearls, have all become invaluable in my kitchen since going gluten free. I would love a great quinoa bread recipe. Anyone?! i have only one recipe…quinoa bars and i love the texture so would love to learn to make breads with it! thanks for the opportunity for the book! We love Quinoa but have not ventured into baking with it. That bread from the cover would be the first thing I would try. I’ve been using quinoa for some time as a healthy and protein rich alternative to rice. My two young sons, who may be the pickiest eaters in the world, have developed an unknown food allergy and we have had to go gfcfsf. Finding baking recipes like quinoa molasses cookies make the transition easier! You are right when you say that many people don’t know about quinoa until they go gluten free. I’m one of them. I would be pleased to win this cook book and expand my quinoa recipes beyond eating it like rice. I keep hearing about amazing quinoa salads and would like to try making one of them. My favourite recipe with quinoa is a terrific chocolate cake that is almost like a brownie. My non-GF friends and family rave about it! I love quinoa!! I’ve tried cooking with quinoa, but haven’t had much success. Having this cookbook to help me would sure be great. The bread on the cover looks great! I made a quinoa salad that I loved, but I’m always on the lookout for new recipes! I so hope I win the free quinoa recipe e-book as it sounds awesome! Right now my favorite quinoa recipe is to soak overnight 3/4cup red quinoa, slice length-wise and carmelize one onion in butter (I like goat butter), add one diced homegrown portobellow mushroom sauteed, then pour in the rinsed red quinoa with enough water to cook the quinoa for 15minutes making sure to scrape the bottom to get all the carmelized onion flavoring spread throughout the dish, salt and pepper to taste and enjoy! I have been incorporating more quinoa into my diet. Thank you for the giveaway. I’ve been wanting to try these: http://www.queenofquinoa.me/2012/12/honey-cut-out-cookies/?utm_source=rss&utm_medium=rss&utm_campaign=honey-cut-out-cookies Thanks for the giveaway! I love cooking quinoa in the pressure cooker. 1 cup well rinsed quinoa to 1 1/2 cup water. Bring to high pressure, cook one minute then natural release for ten minutes. Comes out perfectly every time! I want to try making a sweet quinoa salad – I had one a few years ago with orange, cranberries and some kind of candied nut that I would love to try to recreate. I love quinoa filled Acorn squash, baked! Add a little orange juice for some extra flavor, if you’d like. Yummy! I love quinoa!! We’ve been using it quite a bit in my veg cuisine class too. My favorite recipe is the quinoa muffins I make, so simple and delicious. I would love to see the recipe for the bread on the cover of the book…looks tasty to me. Hmmmm…. My favorite quinoa recipe, love them all but this is one I have when I have left over plain quinoa, sometimes I save some just for this purpose. I mix quinoa with sundried tomatoes in olive oil top with pine nuts and/or hemp seeds, warm it up and enjoy it for breakfast. Warming, yummy and delightfully satisfying!!! I made a quinoa and chickpea salad with sun dried tomatoes, roasted red pepper, lime juice, shredded kale, and probably some other veggies… it was yummy. I’d love to try baking with quinoa. Whole quinoa or quinoa flour? I guess I could probably make my own quinoa flour from whole quinoa? I like quinoa as a compliment ingredient (rather than the main ingredient) to add more protein to what is already in the recipe. Oh, I am so looking forward to trying some of the recipes. Thanks so much! I like quinoa in many recipes that call for rice. In warmer months, we make a salad with quinoa, black beans and mango. I would love to try and to find a great recipe for gluten free Quinoa pancakes and waffles! I have been searching for more than a year and nothing seems to come out right still. still searching! Thank you so much, Shirley and Alyssa! I am excited to hear I won the ebook. I am looking forward to learning new recipes to use quinoa. Thank you so very much for picking me, and for running the contest. Thank you, Alyssa, for all your very hard work in creating this book! !